← Does sleep REALLY matter? As I am getting ready to fly to NYC tomorrow, I am reminded of a common mistake parents make. It is easy to soothe babies using motion – we all do it, including swings, strollers, car rides, rocking, etc. Often these are last resorts for getting a baby to sleep and a tired parent will do whatever it takes! However, “if the child is always sleeping in motion – in strollers or cars – he probably doesn’t get the deep, more restorative sleep due to the stimulation of motion,” says Marc Weissbluth. He relates motion-induced sleep to the type of sleep an adult might get while flying on an airplane (not restorative!). Using motion to soothe a cranky baby is not a bad thing. Motion can also be used as part of a bedtime routine or to help a child become sleepy, but be careful not to rely too much on motion. 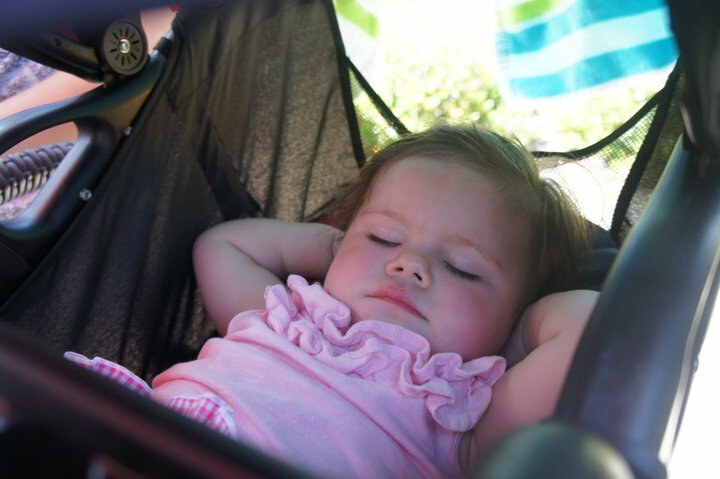 Once the child has fallen asleep, just be sure to turn the swing off or park the stroller. Also, you want to be sure the child can recreate whatever it is that helps him fall asleep on his own, so that when he wakes up he can put himself back to bed. If he needs to be rocked in order to completely fall asleep, he is also going to need to be rocked to fall asleep each time he awakes at night (will talk more about this on another day!). So remember… use the motion to calm your baby, not for him or her to fall asleep. This will allow your child the opportunity to have some deeper, high-quality sleep, and he’ll be more likely to stay asleep longer and generally be more rested.